It goes without saying we all like good food, right? However, not all of us like to cook or think of ourselves and good cooks. What if I told you, you can cook tasty home cooked meals and have literally no clean-up. Sound too good to be true? 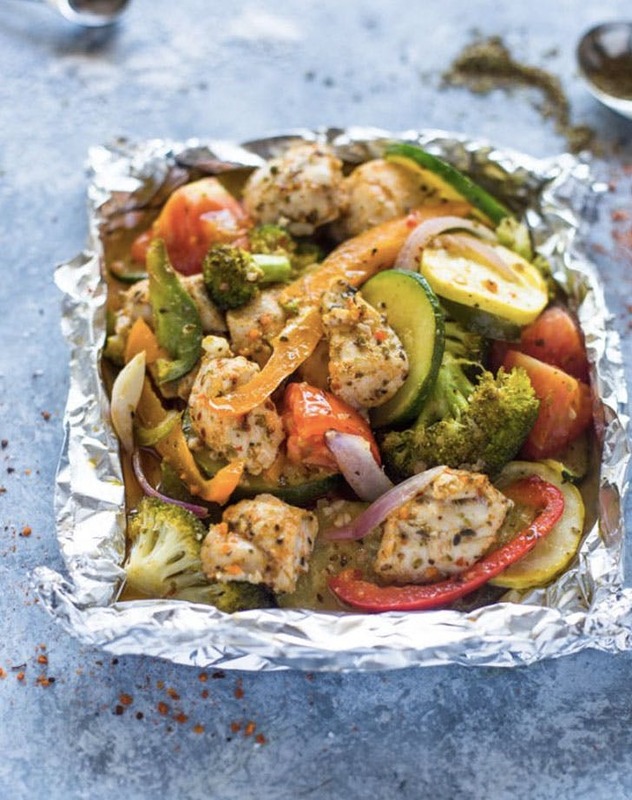 Stay tuned as I tell you about Foil Packets that can be made to perfection by the novice cook as well as the “seasoned cook” – no pun intended. 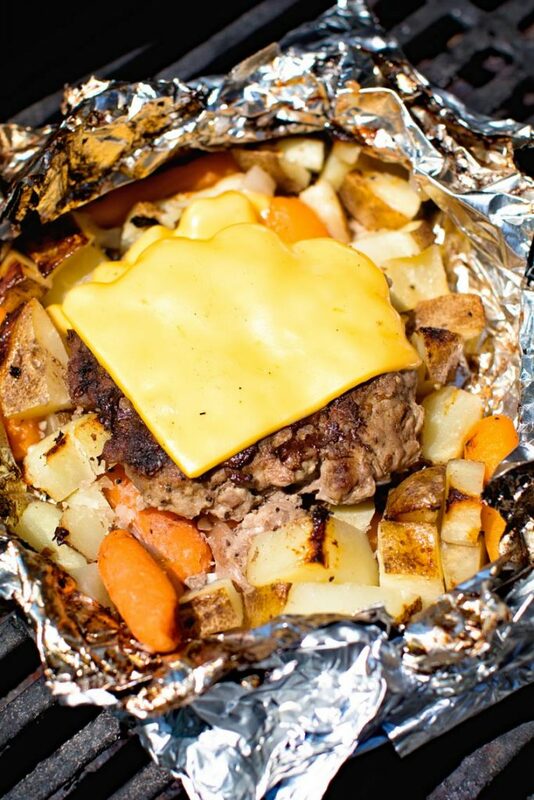 When we hear “Foil Packet”, the first thing that likely comes to mind is Hobo Dinners and camping, well, even though that is true, Foil cooking has been kicked up to a new level with more options that you can imagine. 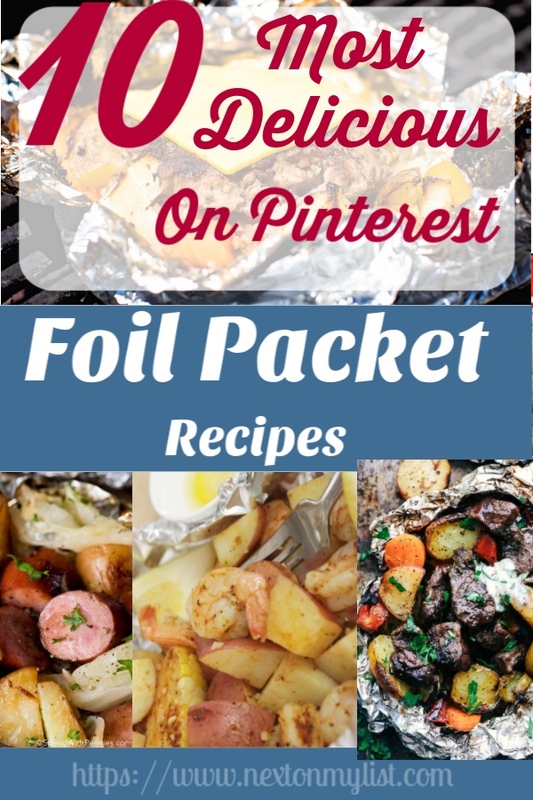 First, we are going to look at 10 of the best foil packet recipes on Pinterest, and yes, there are so many. Also, this is just a starting point for you as you modify Foil Packets to match the preferences of your family. Honestly, I do love to cook. For the most part, my favorite type of cooking is trying something new that looks and sounds delicious, but I’ve never made before. So even though, I was up for a challenge, I also wanted to add variety and creativity on my list as well. Let’s start with a more traditional definition of a Hobo Meal with beef, potatoes, and carrots. In addition cheese makes it a juicy cheeseburger without a bun. How can the flavor not be wonderful when you include bacon, ranch butter, chicken, potatoes & cheese. A great meal for the entire family. 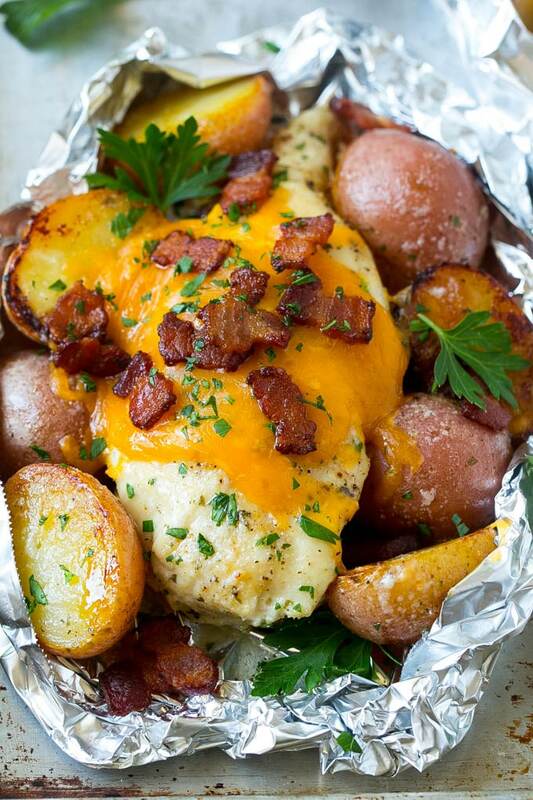 Chicken is a popular choice in many foil packets because it fits so well with almost any cuisine. 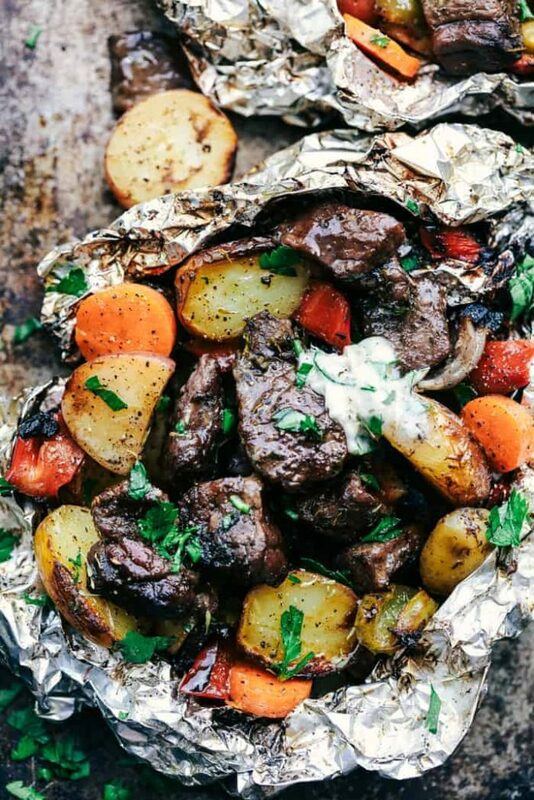 Don’t skip this Foil Packet if you love melt in your mouth beef. Butter along with the perfect combination of herbs and garlic make this one of the MOST delicious Foil Packets, to be sure. Tip: Be sure the packet is sealed tight and flip them when close to done to char the meat and vegetables. 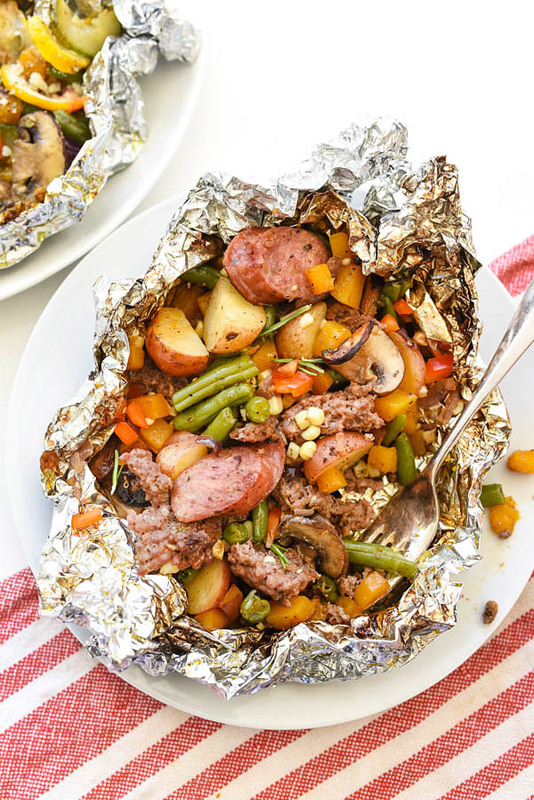 By now, I bet you would really like to take a stab at making your own Foil Packets. I can help with that! Grab this Foil Packet Menu Planner that comes complete with a BUNCH of ingredient ideas for proteins, vegetables, cheeses, spices, etc. You’ll also find assembly and cooking directions. After you practice, why not consider a party? In fact, I am for sure going to have a Foil Packet Party! I love Mexican food for sure, so I can throw this together in no time. All you need is chicken, peppers, onion cooked rice, & Cheese. In fact, this is a great recipe to throw on the grill in packets when you have company over for a football game or other fun event. Tip: Serve with warm tortilla and rice. When I make rice, I make a lot and freeze two cups in Ziploc freezer bags. Honestly, have you ever seen a dish look so perfect? First, shrimp, steak, and corn on the cob, all seasoned perfectly. Next, throw in some red onion, and tomatoes – so good. Tip: This cooks pretty quickly, so after 6-8 minutes on each side, take a look to see if the shrimp is cooked through and the steak is still a little pink. 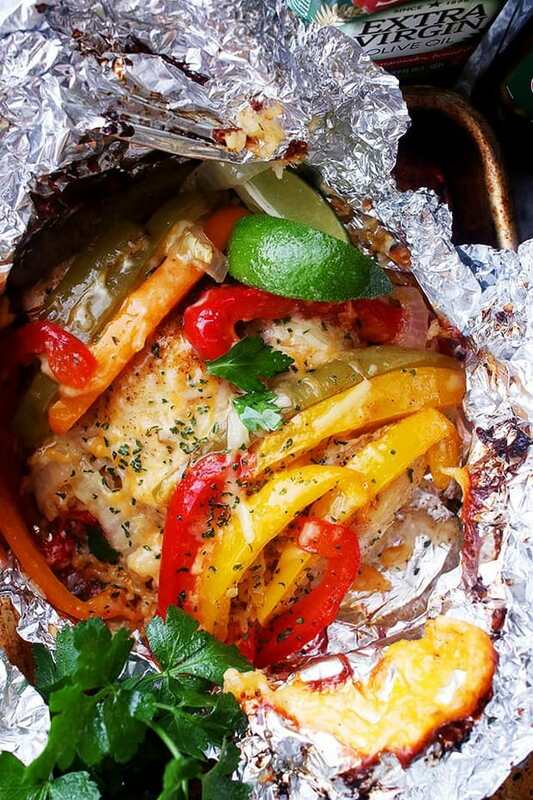 Just look at all the tasty ingredients in this Foil Packet Dinner. Seriously, hamburger, sausage, mushrooms, potatoes, corn, green beans, peppers, and more. Together with butter and herbs- Impressive! Tip: As with all of the recipes, it is a good idea to spray the foil with Pam to prevent sticking. Also, with all of these ingredients, your group could really build their own. Add your favorite sauce as well. Asian food in a foil packet? So easy and so creative! 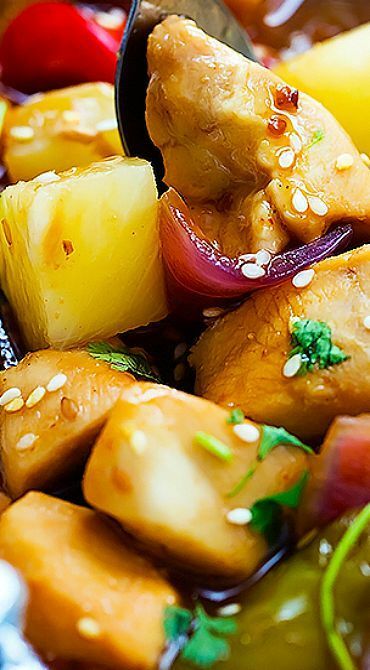 Chicken, onions, peppers, and pineapple all in a tangy teriyaki sauce. Finally, sprinkle on some sesame seeds- done. Tip: I like spicy Asian, so I might add some Sriracha sauce, and serve some rice on the side. Again, look at this recipe, don’t you want to make this right away? Mediterranean Salmon Foil Packets with Lentils is healthy, and it will be ready in 30 minutes. Then, bake or grill it with summer veggies. In addition, Rosemary, Oregano & Thyme perfectly season the salmon, zucchini, tomatoes, corn, peppers, and shrimp! Also, the recipe site includes a video. 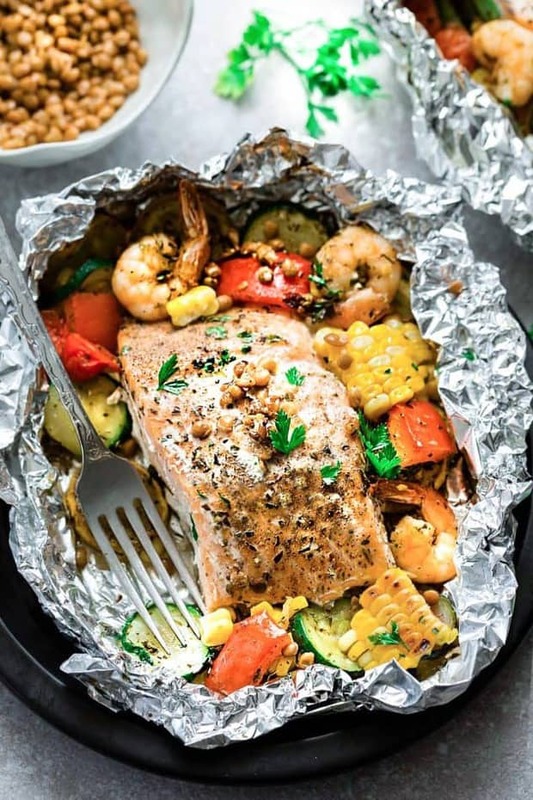 Tip: Fish is perfect to cook as a Foil Packet and there are several salmon recipes out there, but this one meets the criteria of creative and unusual. I am totally making this for dinner quests and my salmon loving daughter. I really love cooked cabbage. You are probably asking yourself right now, what doesn’t she love? 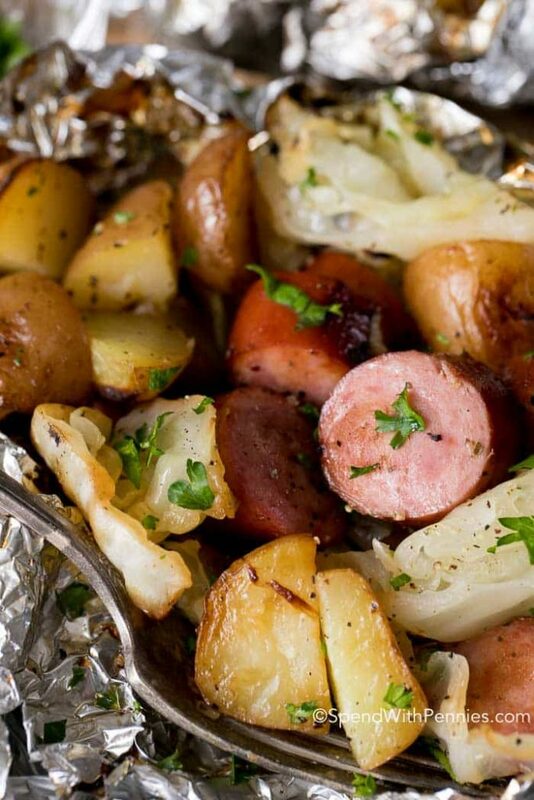 Of course, comfort food at its best is sausage, cabbage, potatoes, onions in a garlic butter sauce. Not to mention, only 15 minutes on the grill! Tip: The recipe suggests putting an ice cube in each packet so you can control the amount of liquid. Do you usually have a lot of vegetables on hand, because this recipe is a good way to use them all. Vegetables could almost the main ingredient with Chicken, garlic, and Italian seasoning . Tip: Serve with rice or noodles. Throw in a pat of butter if you’d like. Why not? 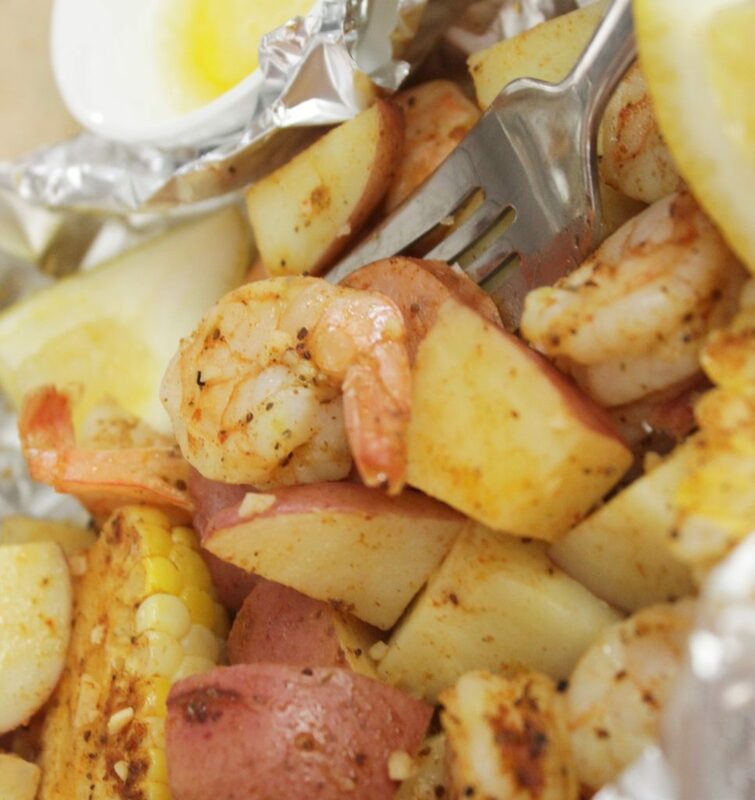 Shrimp boil with sausage and potatoes is outstanding if the spices are right. There is a lot of thought put into this recipe but it still easy and totally delicious. Ultimately, the secret to the dipping butter is to melt it and let it get a little brown too. Tip: Cook the potatoes and corn about 10 minutes before putting adding them to the foil packet. If you missed it above- do not skip making the brown butter! 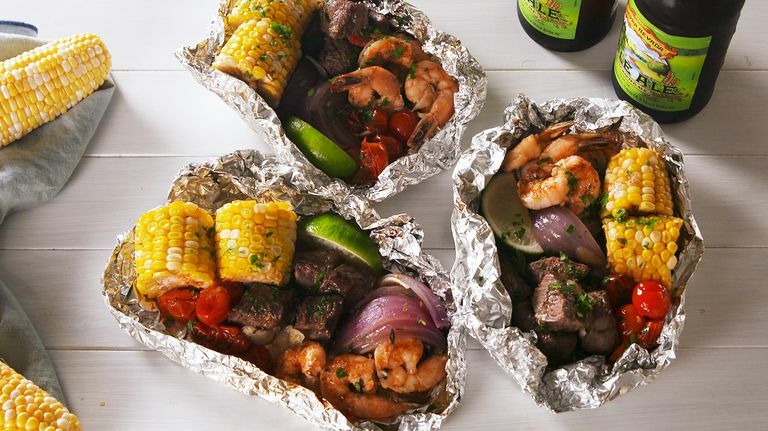 As shown above, these are really delicious Foil Packets and are not hard to make. I will tell you that while they are on the grill, the smells are as wonderful as the flavors. 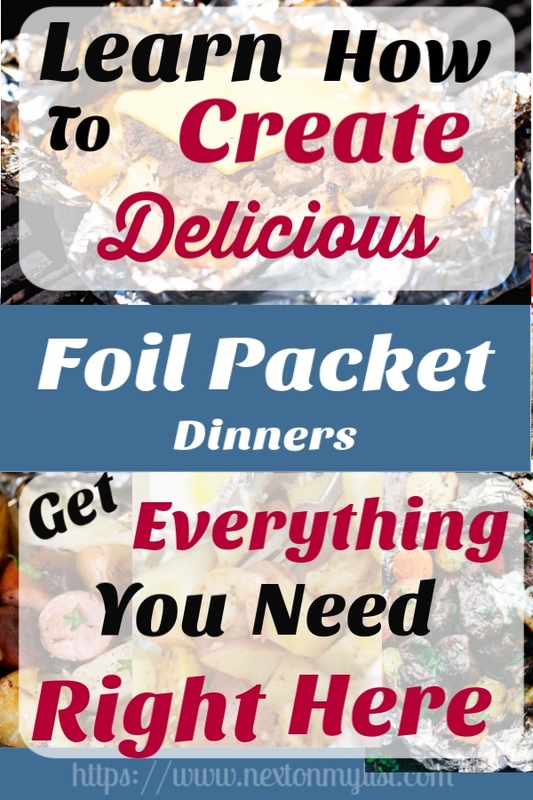 Have you decided which Foil Packet you will make first? By all means, please let me know!